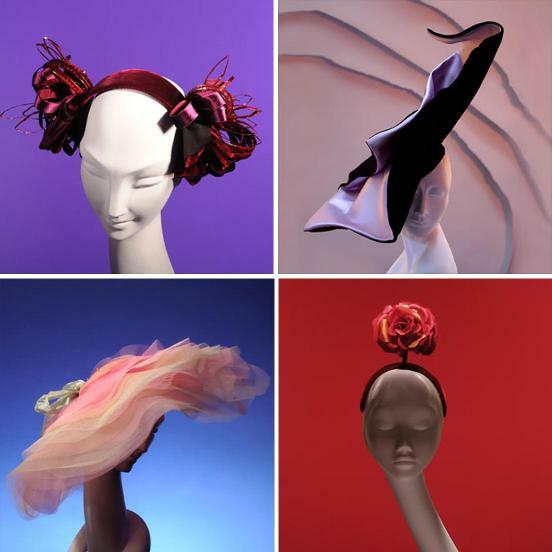 This year, legendary milliner Stephen Jones will celebrate the 30th anniversary of his design house, Stephen Jones Millinery. 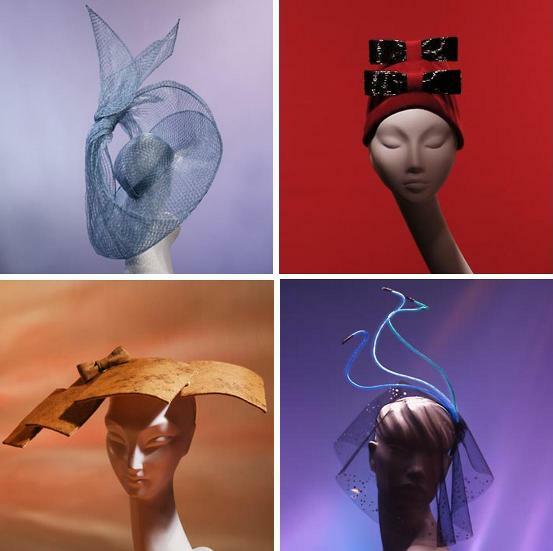 To commemorate the event, Antwerp's Mode Museum is hosting "Stephen Jones & The Accent of Fashion," a comprehensive exhibition of Jones' hats and a look at his career, which has included partnerships with Jean Paul Gaultier, Comme des Garçons, John Galliano, Christian Dior and Marc Jacobs. 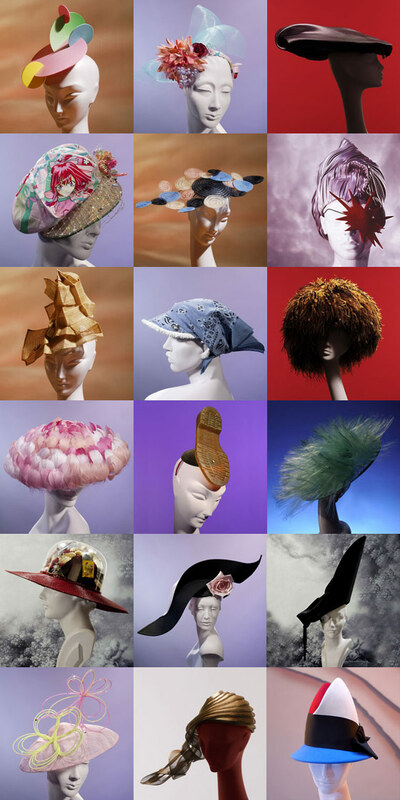 While the hats we're looking at here today came from an assortment of Jones' collections, the hats on display at MoMu come largely from the private collection of Belgian shop owner Geert Bruloot. 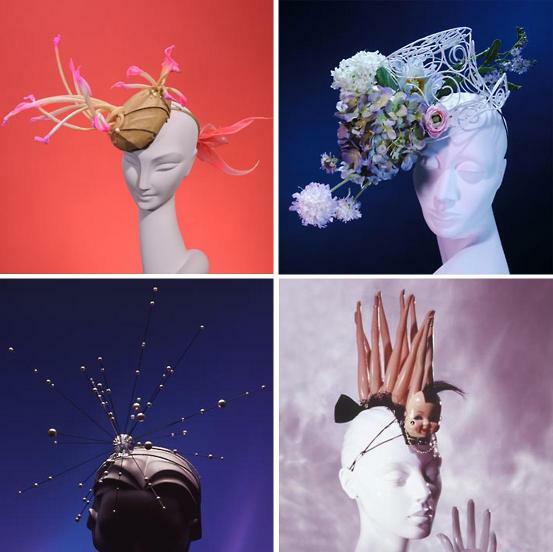 According to an article in the New York Times, Bruloot has amassed the world's largest collection of Jones hats, which he used in window displays. Among the hats Bruloot purchased were "sparkling tiaras that looked like planetary constellations, berets shaped like puffins and painter’s palettes and silver-plated gangster fedoras. ... They demonstrate a fantastical range of work, from the subtle wit Jones applied to the classic pillbox shape (by adding a sparrow diving into the center of the hat) to outrageous concoctions like Eggs & Bacon, from 1984, a breakfast still life made up of a satin frying pan set atop a turban of curling blue flames of organza." Born in Cheshire, England, in 1957, Jones studied art at the High Wycombe College of Art. After seeing a fashion exhibition at London's Victoria and Albert Museum in 1975, he was inspired to enter the industry. He studied fashion at London's Central Saint Martins College of Art and Design, and during that time, got a tailoring position at the House of Lachasse. He requested a transfer to the house's millinery department, and, in order to make the move, created his first hat: a cardboard pillbox covered in blue crêpe de Chine, topped with a silver-sprayed plastic iris. His first hat: a cardboard pillbox covered in blue crêpe de Chine, topped with a silver-sprayed plastic iris. During the next few years, he developed his millinery expertise--and became a regular at London's Blitz nightclub, where he wore his own creations. A cameo appearance in Culture Club's 1982 video for "Do You Really Want to Hurt Me" caught the attention of Gaultier, "for whom Jones began to create iconic hats, like a fez that had been reworked with the traditional tassel as a teardrop." In 1979, Jones designed a line of hats for Italian house Fiorucci, and in 1980, he received funding to open his own salon in London's Covent Garden. His work has been a success since. He uses his own signature shaved head as the fit model for all his designs, which incorporate unusual materials, quirky details and a thoroughly positive sense of attitude--probably why they've been embraced by Hollywood, the music industry and hat fans worldwide. (His designs) incorporate unusual materials, quirky details and a thoroughly positive sense of attitude. 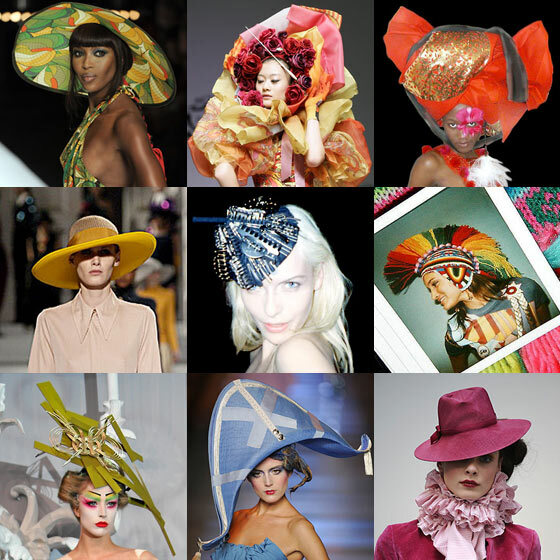 See more patterns and palettes in our complementary post "Hat Inspired Patterns & Colors." "Stephen Jones & The Accent of Fashion" is on display at MoMu through Feb. 13, 2011. Photos by Peter Ashworth from www.stephenjonesmillinery.com. onlystyleremainsthesame.blogspot.comLindsey Baker is a style columnist based in Omaha, Neb. Check out her personal style blog, only style remains the same, at http://onlystyleremainsthesame.blogspot.com, or follow her on Twitter at http://twitter.com/shoptalkomaha.